Even though Bid Cactus has become one of the top penny auction sites, their auctions draw fewer bidders than those hosted by the industry titans. That is good news. Fewer bidders often means that much of the merchandise is sold at lower prices. They do not offer a buy it now option on their auctions and that allows you opportunity to win truly incredible deals. They are one of our top picks for HDTV penny auction sites. Bid Cactus distinguishes itself from other sites by offering different types of auctions, including those geared specifically toward first-timers, beginners, and experts. Another noteworthy aspect is that every item on auction is brand new. You’ll also find numerous promotions at Bid Cactus, such as their Double Points Saturdays and Happy Hour Fridays. Bid Cactus is a founding member of the nonprofit trade organization Entertainment Auction Association (EAA). They are also the oldest U.S. penny auction site. Far from being a scam or even slightly shady, they recently completed their second audit by Ernst & Young, LLP, one of the top four auditing firms in the U.S. They have a very public persona, and are always available by phone or email during business hours. In the past, we have observed a few people referring to Bid Cactus, as well as other top penny auction sites, as frauds. But their reasons for thinking of them as frauds demonstrate that they misunderstand how these auctions work. They participate with inaccurate notions about penny auctions, and thus have the wrong expectations. It is no surprise that they leave disappointed. At these sites, bidders buy bids. Each one costs between $.50 and $1.00. That’s how the penny auction sites make money. An item can start with an offer price as low as $.01, and each bid placed for it raises its price by another $.01. This is how a $500 laptop can sell for $20, and the penny auction site will still make money. Again, they sell bids. We have a detailed tutorial that explains how penny auctions work elsewhere on our site. It’s important to realize that it is possible to lose money. We recognize that there are many penny auction sites that are less trustworthy than Bid Cactus. This is the reason we created our “safe penny auctions” page. If you’re just getting started, and want to avoid the scams, we recommend that you start there. We also invite you to read some of the Bid Cactus reviews toward the bottom of this page. These reviews were left by real bidders who participate in the auctions with the right expectations. 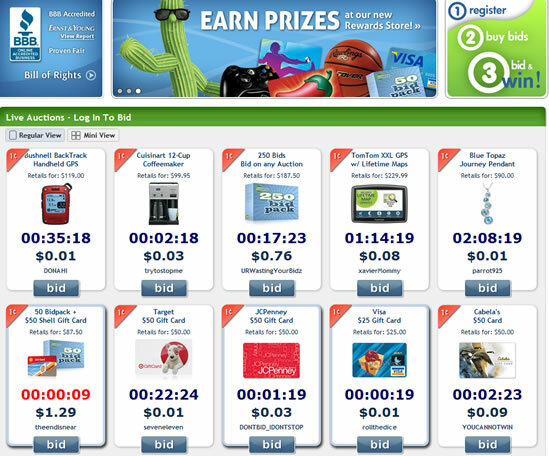 Because Bid Cactus is a medium-sized penny auction site, their list of items on auction is slightly limited in comparison to the largest sites. They still offer a wide selection of name-brand products, but have yet to reach critical mass. We expect they’ll continue to grow, and add more high-quality items to their already-impressive auction list. iPads (a recent auction ended with a 32G model selling for $33.31). Every product is shipped within 48 hours. Bid Cactus also sends emails to auction winners when the items have left the suppliers’ warehouses. This helps to keep them informed about delivery times, so they’ll know when to expect their products. Having said that, the penny auction site realizes the postal system is not infallible. So, they encourage auction winners to notify them if items are not received within 15 business days. Delivery charges are determined on an item-by-item basis. That is, the cost of shipping will vary by the product. Heavier items (large televisions, notebook computers, etc.) will cost more to ship than lighter ones (e.g. sunglasses, gift cards, etc.). Our review of Bid Cactus is designed to give you the information you need to get started at the site. But few things are as compelling as personal ratings and reviews offered by people who have recently used the penny auction site to bid for products. We’ve included several of them below. After reading them, take a moment to leave your own Bid Cactus review with a few comments about your experience. Doing so will help others who are thinking about joining the site and getting involved. Drop by BidCactus.com NOW and check out their bonus offers! Thumbs up on being able to trust these guys as they are the only standing Penny Auction Site who is a member of the entertainment auction association. They also have outside audits from legit firms. You can trust them. I don’t really bid there anymore as there are other more enjoyable sites. The site is not fun to use, does not keep my attention and I’m not the only one who didn’t have a stellar experience with customer service. Am I alone?